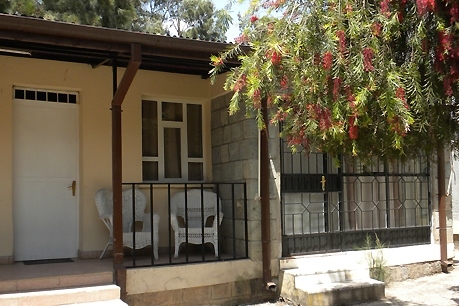 We are so proud you’ve made Sheba Guest House your home in Addis. Below you’ll find more information on the many options available to you. Standard: Including one queen-size bed, Dawit’s Room features a private bathroom, a built-in closet, and a cozy work desk. Located in the Main Beyt. Suite: Whether you’re a couple or traveling solo, Sheba’s Suite is perfect for a more plush experience. It features a queen-sized bed, en-suite bathroom, separate sitting area and built-in closets. Located in the Main Beyt. Suite: This two-bedroom suite is perfect for two but spacious enough for five! Putti’s Suite comes complete with two queen-sized beds, a common living room, and one shared bathroom. Located in the Owner’s Beyt. Suite: This ultra comfortable room offers one king-sized bed and an additional twin bed, making it perfect for 3 guests. Also comprised of an en-suite bathroom and plenty of closet space. Located in the Main Beyt. Standard: Perfect for two, Yemichael’s room is situated in the Main Beyt, giving you direct access to our large common room and front veranda. Also complete with a private bathroom. Villa: Certainly one of our most desirable options, Villa Zed features a private bathroom, queen sized bed, additional sofa bed (sleeps three people) and a kitchenette. Giving you total privacy, Villa Zed is located in the back of the property looking down our landscaped garden. You and your guests can also exclusively enjoy a lovely breakfast on the front patio! Suite: This suite, like Putti’s Suite, is slightly elevated and offers an ensuite bathroom, separate living area with built-in kitchenette and queen-sized bed.